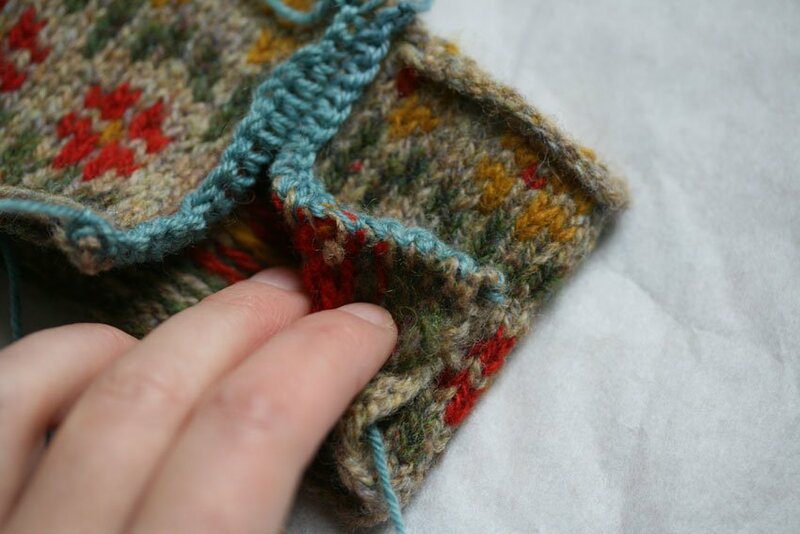 Needle size is immaterial : in which Kate reiterates the most important thing there is to know about gauge and swatching. How much more yarn do I need? Weaving in ends over colour changes on the Ottar hap. Two-colour grafting Follow these instructions to graft stitches over a stripe sequence in two shades, as in the Oa Hoody pattern. Crochet provisional cast on tutorial Follow these instructions to cast on stitches provisionally, as in the Somerled hap pattern. A handy table of shoe sizes and foot lengths, which will be useful when making Kate’s sock and slipper patterns. Covered Button tutorial. Follow these simple instructions to make the covered buttons that feature on the Richard the Roundhead Tam and Scatness Tunic. These tutorials will be helpful if you are making the Bláithín cardigan, the Rams and Yowes blanket, or the Tortoise and Hare sweater. Part 1: What is a steek? In the first clip, Melanie demonstrates Susan Stevens’ nifty and innovative trick for working garter stitch in the round without purling. This method allows you to knit the lace pattern in traditional Shetland fashion, using garter stitch throughout. When knitting the lace section of Betty Mouat you will be working with three colours, and, if you are using the no-purl method, six balls of yarn. In this clip, Melanie demonstrates a neat and simple method for keeping control of your yarns, carrying them up the back of the work. In this clip, Melanie demonstrates rows nine and ten of the lace pattern, where the “cockleshell” is formed. 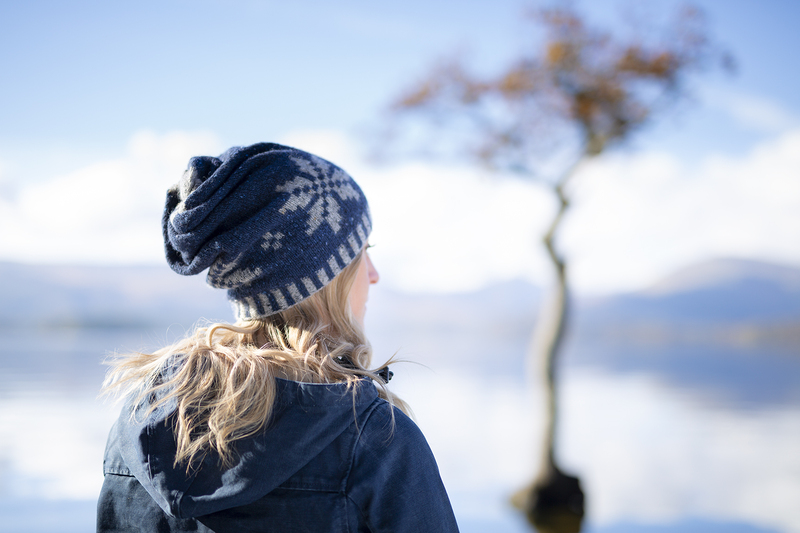 If you are knitting one of my hat patterns, you may wish to read this tutorial on how to read colourwork charts when shaping a hat crown. If you are knitting the Paper Dolls sweater, you may wish to read this post, in which I discuss yoke customisation, and colourwork tips. I do not speak English, I do it through a translator. 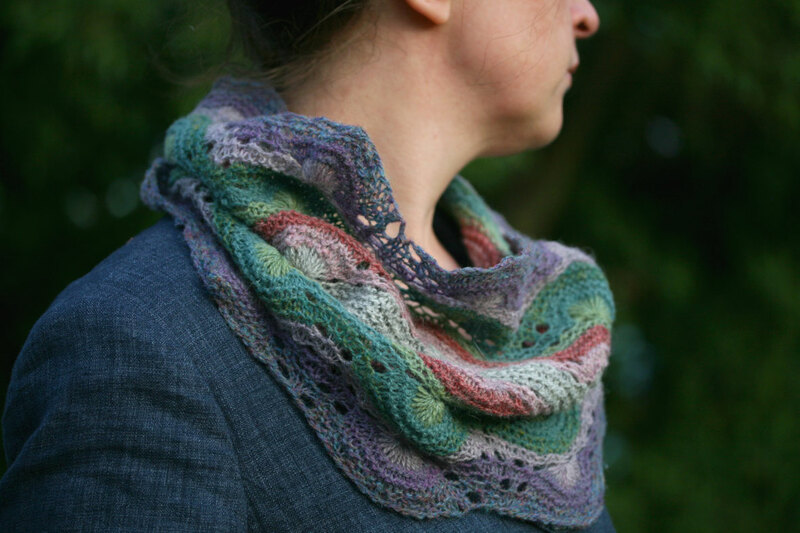 A few months ago I bought the pattern A Hap for Harriet, and I have many doubts, is there any way you can help me? Could you give me an email address to write my questions? thank you. Hi Ulrike – can you email us at info@katedaviesdesigns.com so we can help? Thank you for the Ottar hap tutorial. So easy when you are shown how its done in beautiful clear steps. I love the pictures of your wedding. Such beauty! I would love to make a cardigan like yours for my daughter who’s going to get married next year. Is it possible to buy the pattern. If not, can you recommend something like it? Hi Margaret, thanks so much! I’ll be releasing a pattern for the cardigan next year, though this may not be in time for you . . . Sorry I never replied your answer…I didn’t reed it until today. Maybe the pattern will be on time. I hope so for I still think it to be really beautiful. I love to read your blog. I makes me feel happy and wanting to make more lovely things. I adore your work, your patterns are awesome and I will knit the Blue Bells Sweater for my little daughter’s birthday. I’d also love to make the bag that unfortunately has been removed from this site. Could you please, please send it to me, I promise not to copy or sell it! I’m glad I came across your work, thank you so much, it makes me wanting to make progress with my knitting. How do I knit something a metre square. What sort of needles will take that many stitches? I made a ‘Two Kates’ project bag a while back, and came back here looking for the pattern to pass on to some admirers. I can’t find it! Is it no longer available, or has it been relocated? Hi Margaret, I’m afraid I had to remove this tutorial as folk were copying the pattern & selling it. Thanks for the great tutorials for making Betty Mouat – gonna get started on my cowl as soon as I can! I don’t see the covered button tutorial for the Richard The Roundhead Tam. Where is it? I JUST landed from a whirlwind tour of Ireland, and a length of fantastic Donegal tweed landed with me….I am planning a shoulder bag with it! but I am wondering if it’s necessary to bind the tweed to some sort of backing to stop unravelling? Sounds silly, but I am in no way a seamstress! Thanks! No purl garter stitch in the round: thank you so much for making this video. It is kind of life changing for my knitting, I usually hold off doing in the round garter stitch projects because, while I love knitting in the round, I feel that unnecessary purling puts a damper on the whole thing. I found this on my birthday and feel like you gave me a present! Thank You! I really love your work and how it inspires other people to knit and be creative. Thank you so much for including the historical content in your patterns, as I feel it is a crucial part of each design you make. Well done Kate, keep up the good work. I love your designs, your blog and your beautiful sweaters! So inspirational. Is there any way you can compress the bag tutorial? It’s 32mb for four pages and my browser and printer want to explode downloading that much. I think you need to compress the photos before sending it to the document. Very helpful to have a demonstration. I cannot seem to purchase your patterns on revelry??? What an inspiration you are! Discovered this site whilst searching family history – my great-great grandmother was Sarah Morphew (nee Standen) and have sometimes wondered whether my love of textiles came from her. A business woman, yes, but caring also, I believe. Thank you for this lovely website. I’m not very good at all things electronic – but shall try to re-visit often. My Grandfather was Robert Mouet Fothergill. His mother was the sister of James Jamieson of the Columbine. Mate I think was Bobby Smith. Have camped from South to North. Have mothers pre1939 photos and other much older familly one including the Columbine. Thank for such a wonderful presentation. Now 81 and may not get north again so have to put up with the Lake District! I’ve just watched your tutorial on making the cockleshell – that is so neat!! /What a great wee technique. Very clever – I haven’t come across this before. Did you invent it? Those tutorial videos are great. I like how clearly Mel speaks, and the fact that I feel I can can hear either rain on the window or the sea and some seagulls very slightly in the background. Did you add those sounds in or are they just a happy coincidence of where you filmed? The videos are really helpful and the techniques well explained. I love that you have put these tutorials up, and that I could start with the cowl pattern if I was a bit intimidated by trying out the sweater first! Genius. You inspire me. Your eye for detail is wonderful. and give as a gift to her bridesmaids. Thank you for the pattern. Your fabric is very cute! Thanks a lot for this tutorial. It is a very good idea for a Christmas present! I just made this bag, what a great pattern, so simple I was finished in no time. Thanks for sharing! I have just found your blog because you have been “freshly pressed”, congratulations! I haven’t looked at everything yet, but your patterns that I have seen are beautiful. I don’t have much experience knitting with different colours, but now I am inspired to try. And I love this pattern for the bag, I am definitely going to give it a try. Last year I was in the UK with my family, helping my mother care for my grandmother who had been suffering from transient ischemic strokes for the past 5 years. It was very hard to see a woman who had been so strong and healthy, barely surviving, and knowing that she never would have wanted to live in such a way. She died at home, which is what my mother wanted, but caring for her took a lot out of my mother. As you said in your post, at some point we will all have to deal with this, as carers or being cared for. However as families live more separate lives, taking on this type of care becomes harder, and shouldn’t be done alone. My grandmother suffered from migraines, so does my mother, and so do I. I am fortunate that my husband is very understanding when I am sick, and sometimes knows before I do that a migraine is coming. But the connections between strokes and migraines scares me. I know I am far away, but I hope you don’t mind me putting a link to your blog in mine, your knitting is “hermoso”!